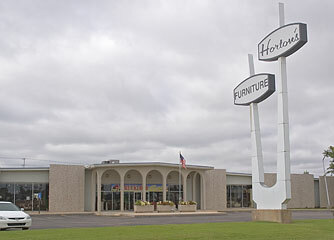 In 1946 Frank and Frances Horton founded Horton’s Furniture in Argonia, Kansas. A lot has changed in sixty years, but hard work and value ethics carry on with our entrepreneurial spirit. We are your Wichita furniture store. At Horton’s we pride ourselves on offering value at all price ranges, which make us the place you can’t afford NOT TO shop. Our staff prides themselves on offering the best possible service to each and every one of our customers, whether you’re shopping for an entire home, or just that special piece. We feel confident that with our large inventory of furnishings, accessories, and special order abilities you will be able to satisfy your own unique tastes. Horton's Furniture has a complete selectionof Wichita furniture including: Sofas, Chairs, Beds and Bedrooms, Desks, Dining Tables, Wood Furniture and more.